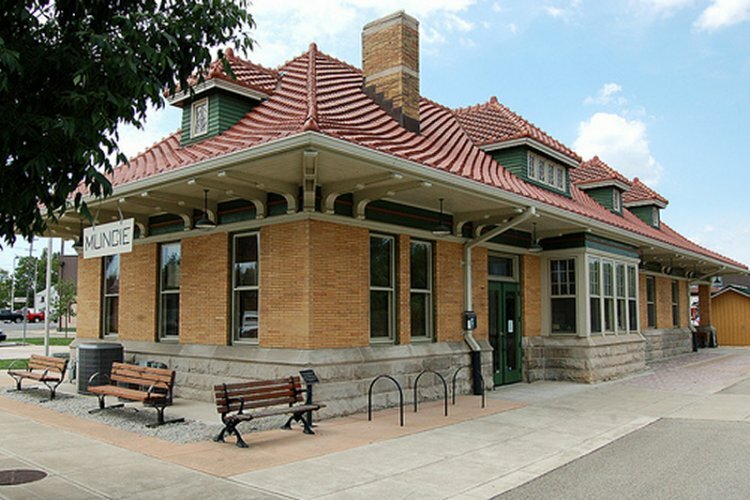 Presented by city, these are the photos that I have located of various railroad stations out of county. I do thank the parties who have lent me photos from heir collections for this site. Their names appear in the photo credits at the botom of the page. 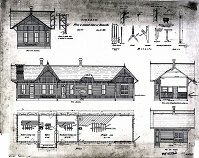 For a larger view, click on the picture. For now, on with the show. 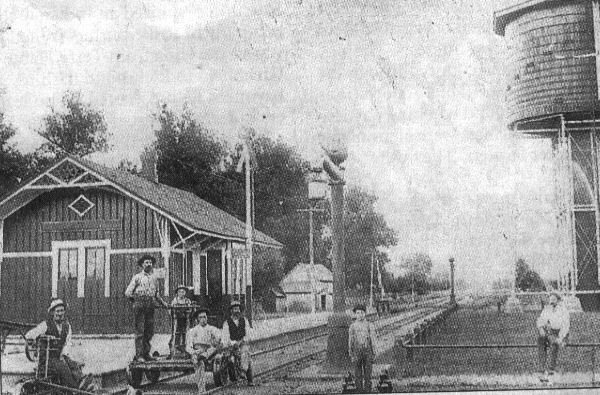 The photo shows a hand powered hand car to the right center along with a locomotive and what would appear to be two people on the platform. Also, notice the lower quadrant semaphore. The engine is a Richmond locomotive (2-6-0?) 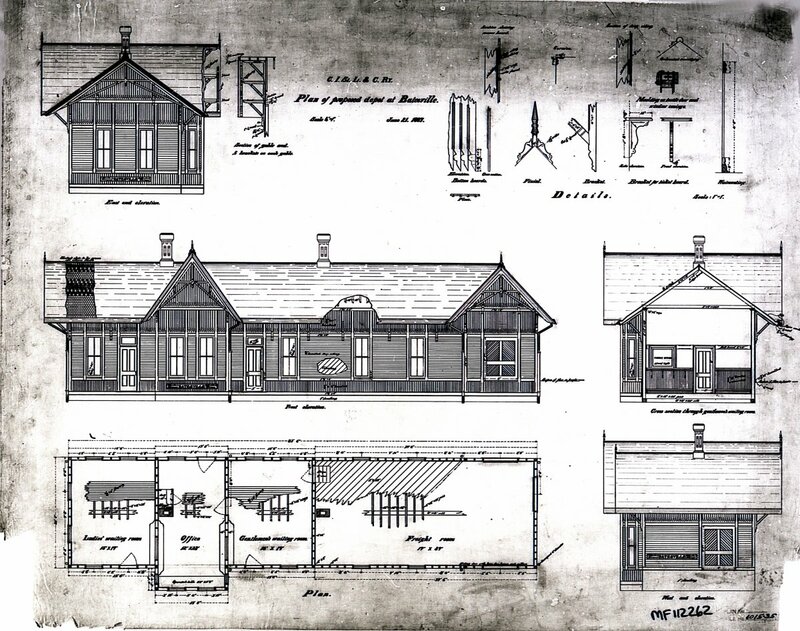 built about 1895. 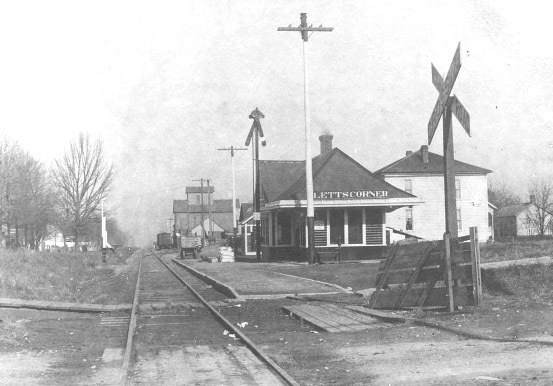 The two houses to the left are still there. 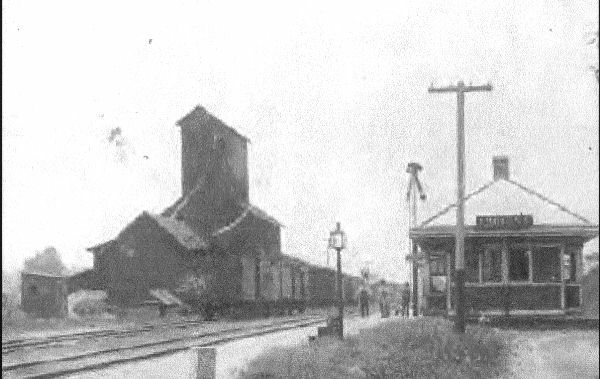 The house on the right is there and the dark building behind the tree burned down in 1946 and took the freight house, which is the building in the background between the loco and the depot . 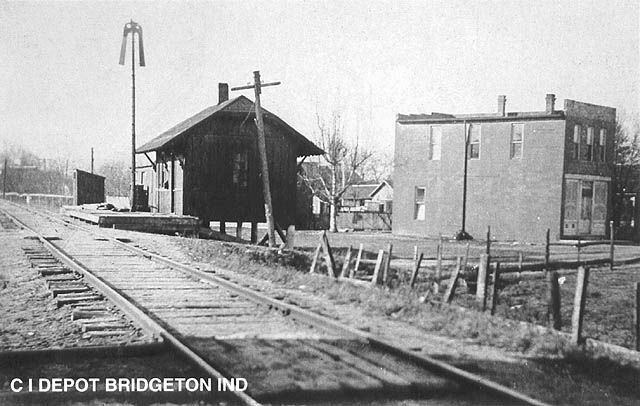 Before 1905 between the car house on the right side of the photo and the house was a water tower. 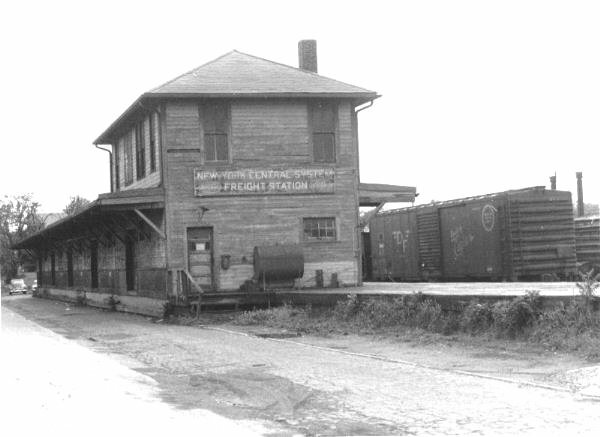 The elevator was rebuilt but the railroad never rebuilt the freight house . 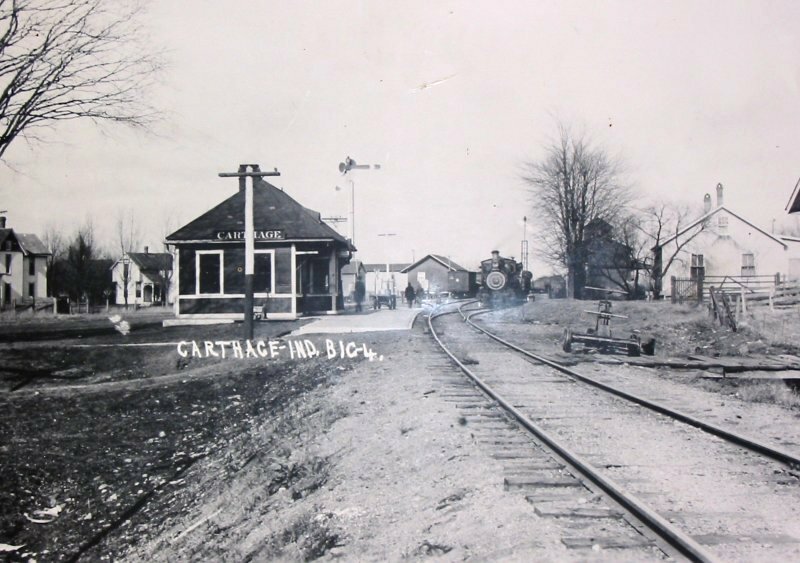 This was located at mile post 193.3 , the mileage from St. Joseph Michigan . This was the start of the 1% grade with a reverse curve south bound . If you go north 5mile to Knightstown you have another 1% grade, both letting the trains out of Blue River Valley and both are about 2.5-3 mile long . 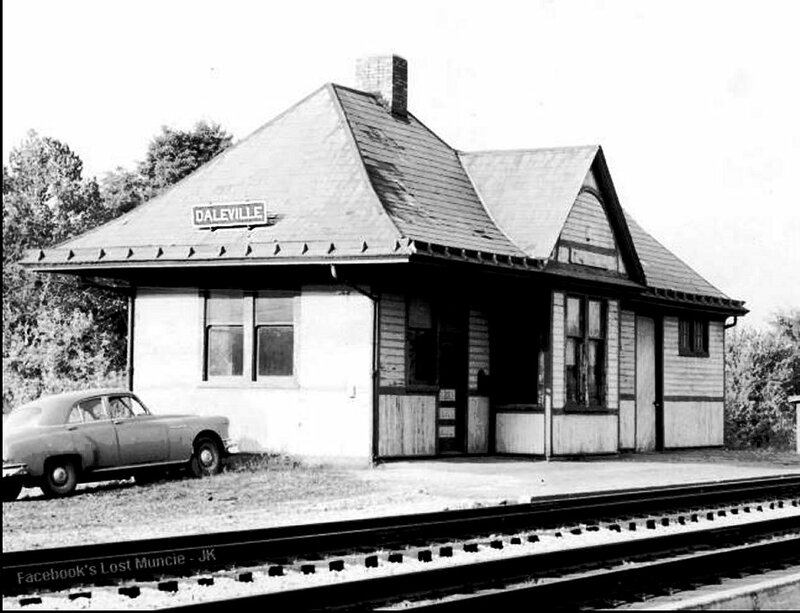 There also was a siding at the top of each hill used to double trains when need be. 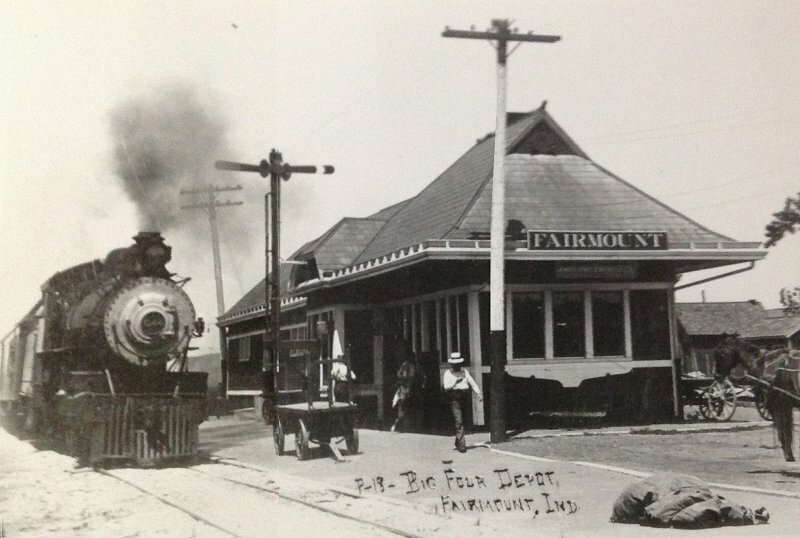 Northbound Big Four Departing Claypool. 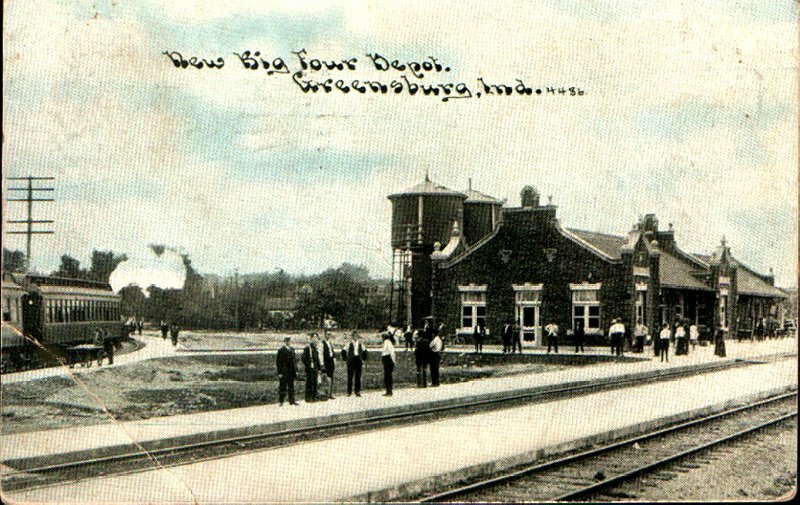 View of the Big 4 depot railroad station in Fairmont, Indiana in 1905. 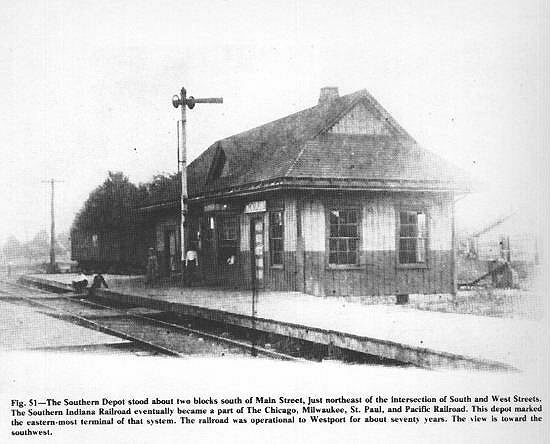 The one story wooden building is located next to the railroad tracks. A signal is mounted in the middle of the structure. Some empty freight wagons are in the loading area. 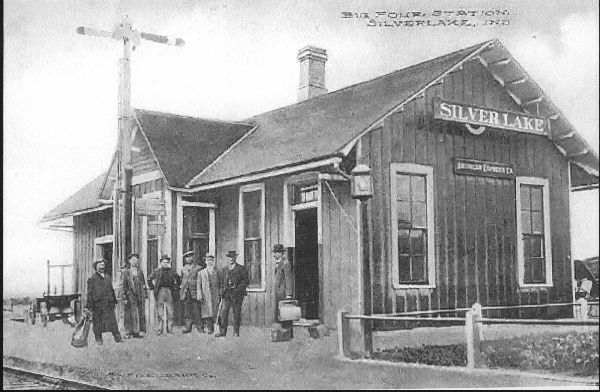 Another photo of the same station taken a later. 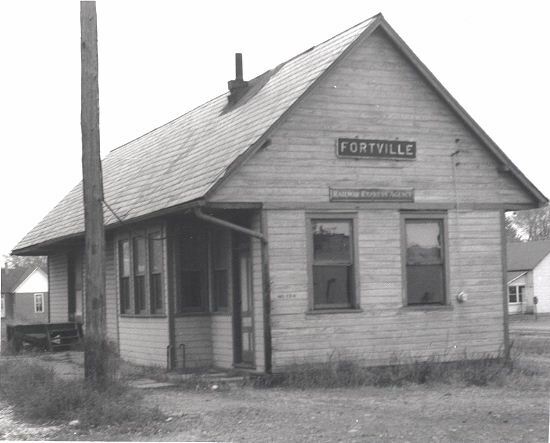 1960 - Fortville Depot has seen better days. Ronald Stuckey Photo. 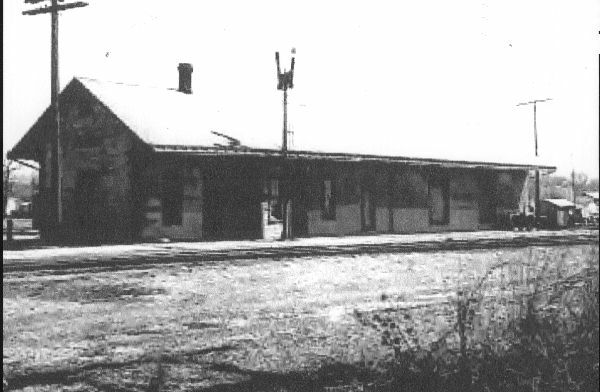 When I last worked there in 2000, there were even asphalt paltforms for both tracks and a freight house just north of the passenger station building. Maurice Lewman says: "At the left edge of the picture behind the coach was the water plug where we stopped to take water southbound. 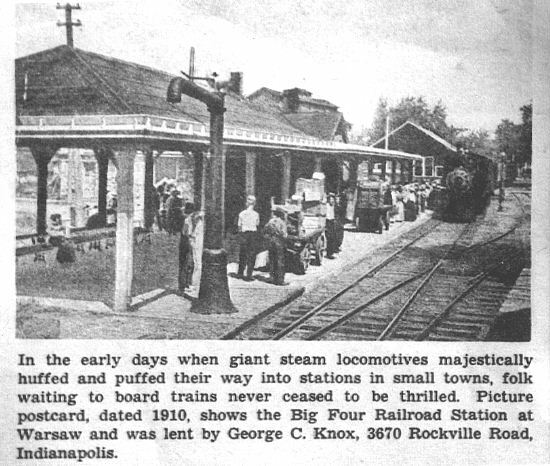 The two water towers were there until the end of steam. The east leg of the wye passed by them. The train is headed north." 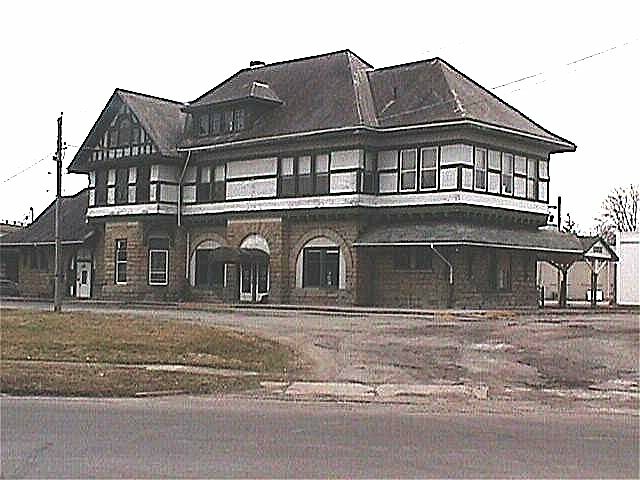 Here is the Depot at Greensburg in it's last days. The track is gone and filled in, but the building still looks pretty good.. Compare this with the Postcard photo. 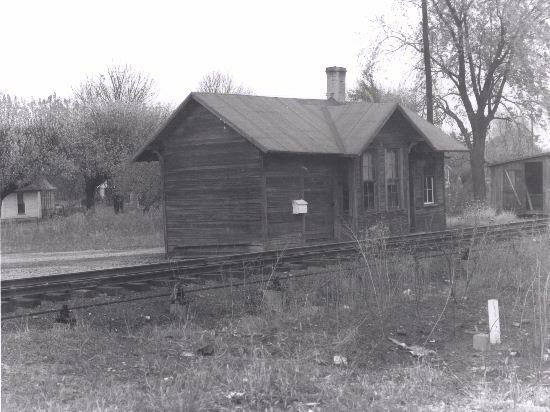 Looking North, first building North of depot is toilet, last building is MOW Section House. Marion Freight House This was in the last days for the freight house, but you can tell by the 5 doors that it had been a busy place at one time. The two pipes at the right of the picture were for the scales to weight cars. 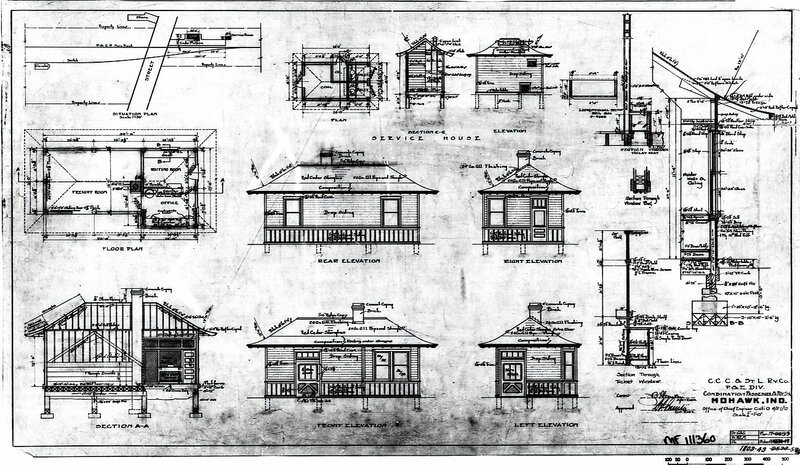 When the Crosley automobile, was built in Marion after WWII, they would bring them down to the freight house and load them in box cars. 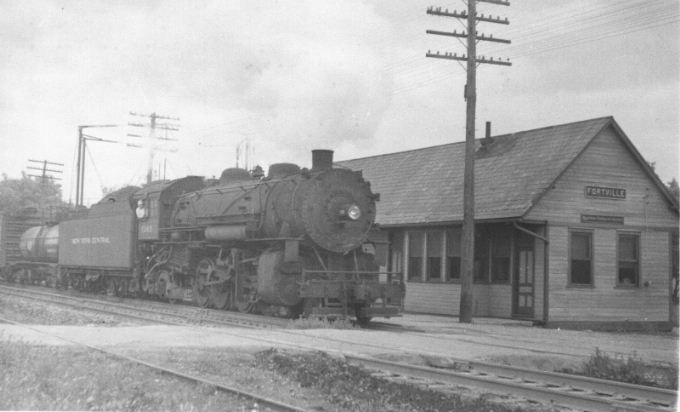 P. E. Railway was later the Springfield Division of the Big Four. Notice the water plug at each end of the wather tank. Both of the track cars are hand powered. 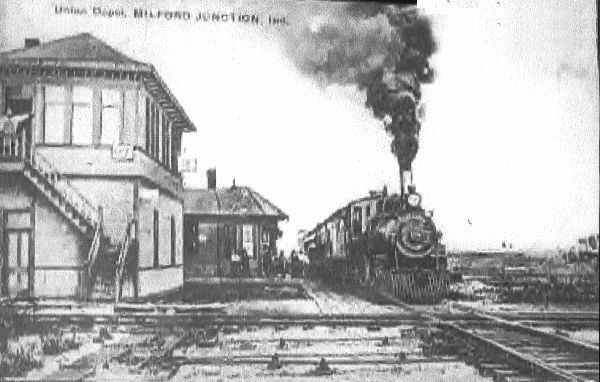 May be either a B&O or Big Four Train. 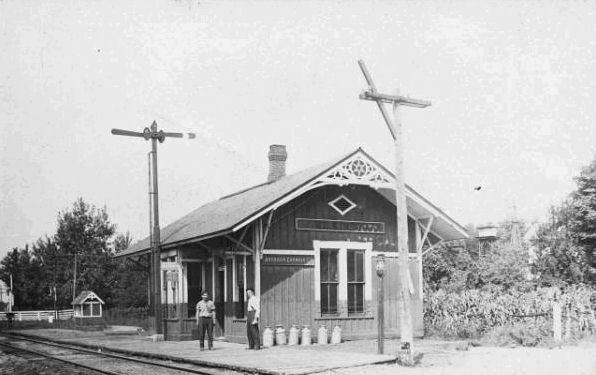 The depot stood at main street and the railroad. 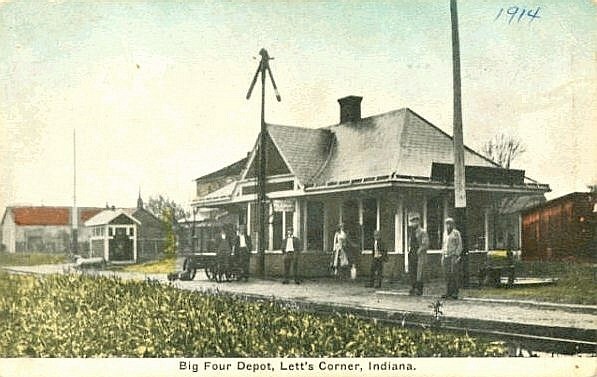 East of the depot was the elevator. 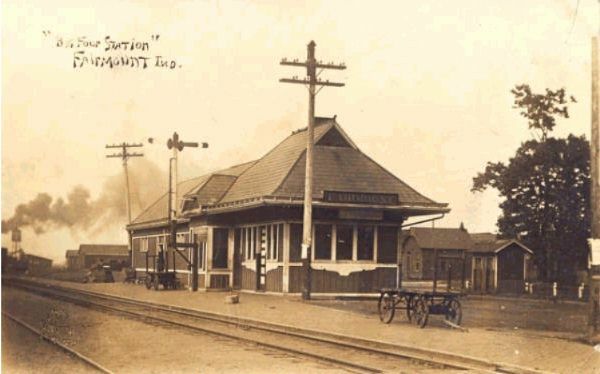 The siding switch was about five car lengths north of the depot and held about 25 cars. 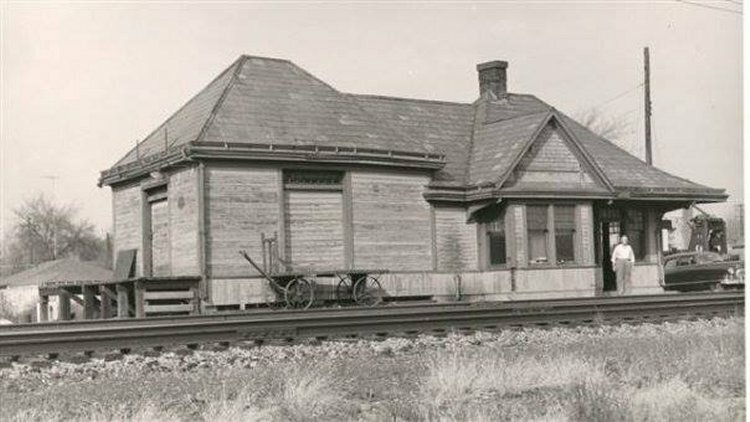 At about a third of the way from the south end of the siding, there were two tracks, one for the elevator and the other used as a house track and team track. 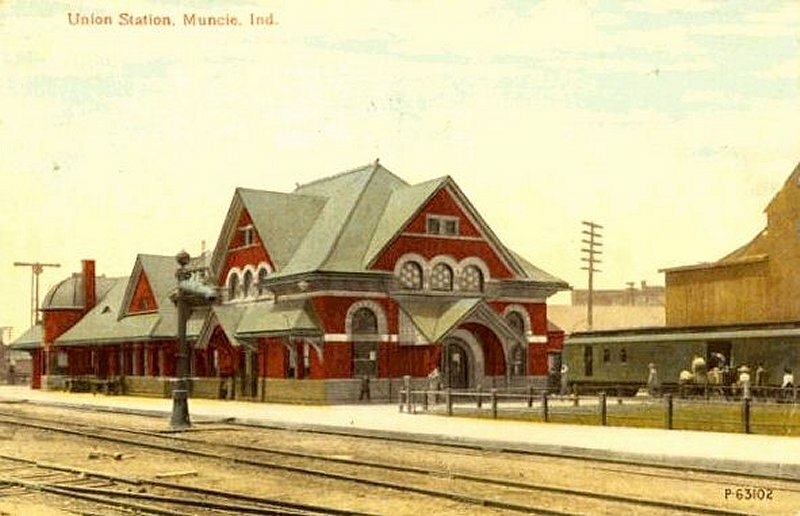 View of Union Station in Muncie, Indiana serving the NKP and Big Four. 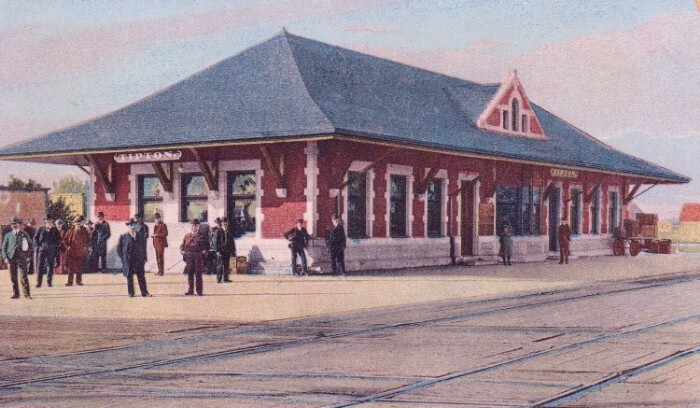 The building is primarily red brick and has railroad tracks on both sides. 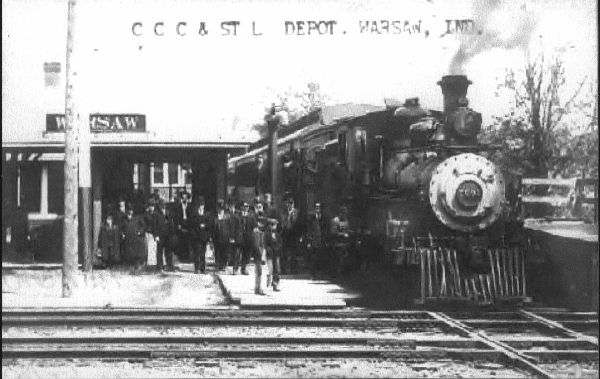 People are shown unloading a railroad car. Postmark: 1905. 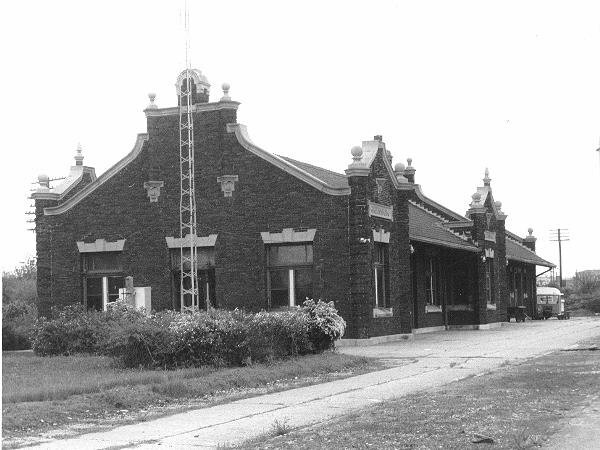 A shot of the same depot taken about the same time. 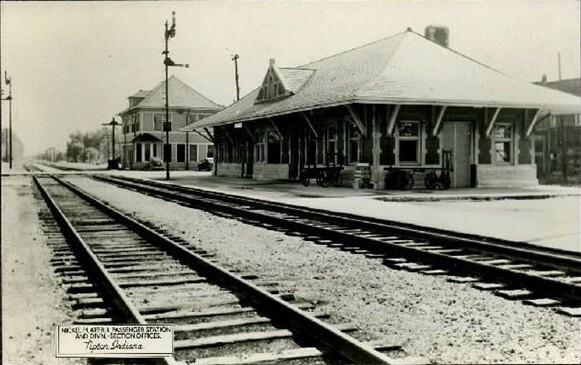 This was the Cincinnati Richmond and Muncie RR in Muncie Indiana. 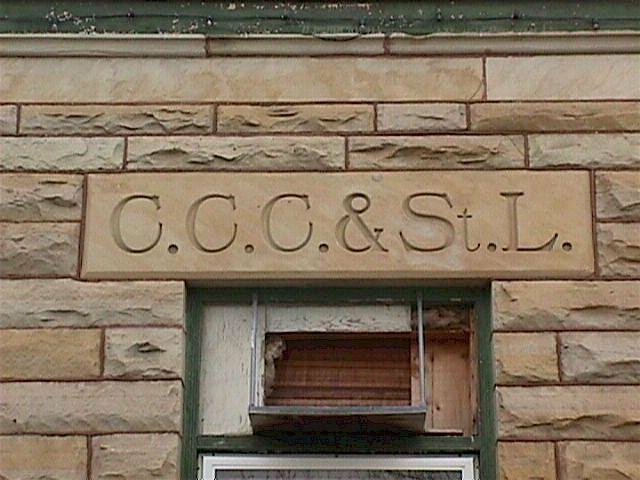 In 1903, they merged with the Cincinnati & Indiana Western RR Co, forming Chicago, Cincinnati & Louisville RR Co. Later, it was to become the C&O depot. 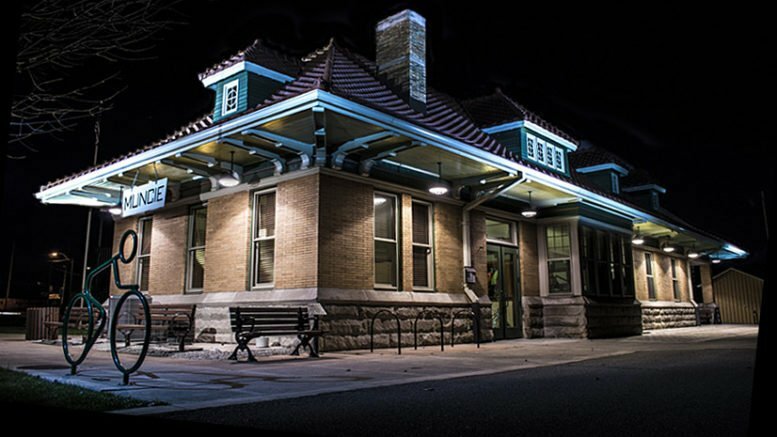 The second shot was taken at night. 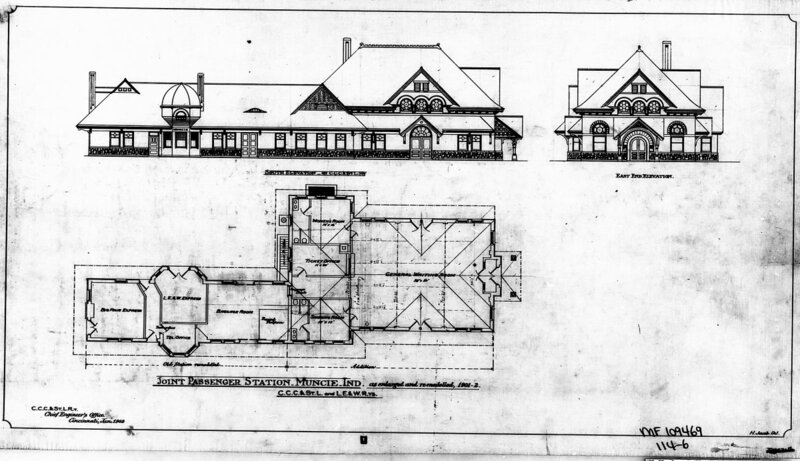 New Paris, IN - 1920? 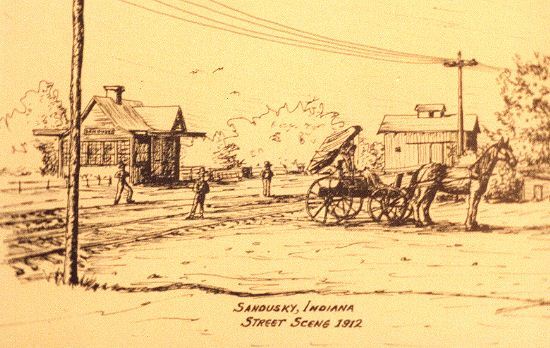 Sandusky had an elevator, store, blacksmith, etc. 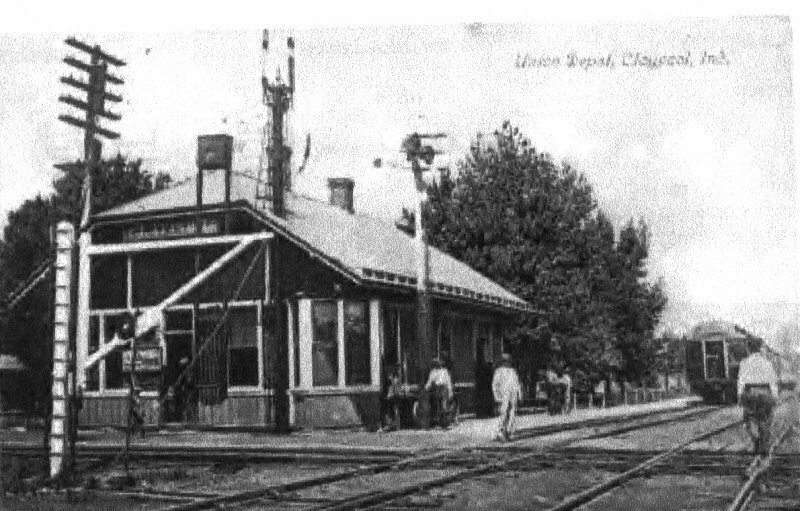 and after 1900, a depot, but was not a block or train order station at this time. 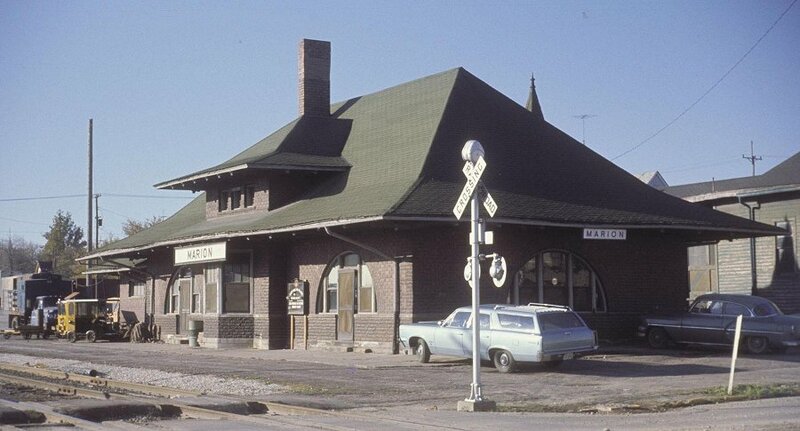 There was a siding located and it was a regular stop for one passenger train each way and a flag stop for two others. There are people and two bicycles leaning against the building. 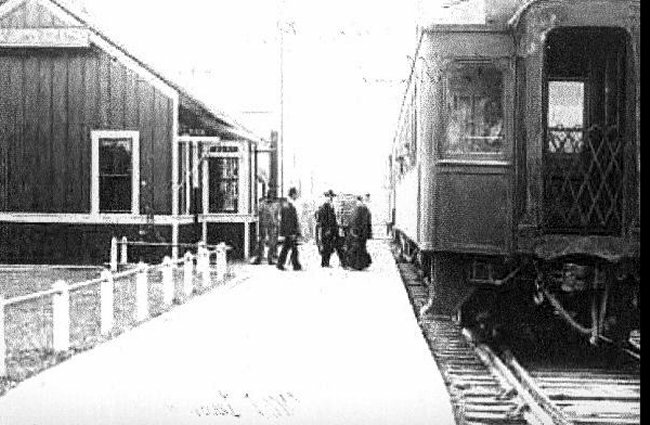 There is a track running directly in front of the Depot as well as to the side where the Big Four train us standing. 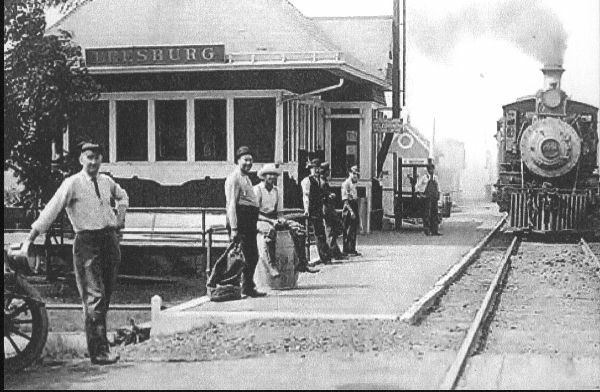 Note also the snowplow at the far right. 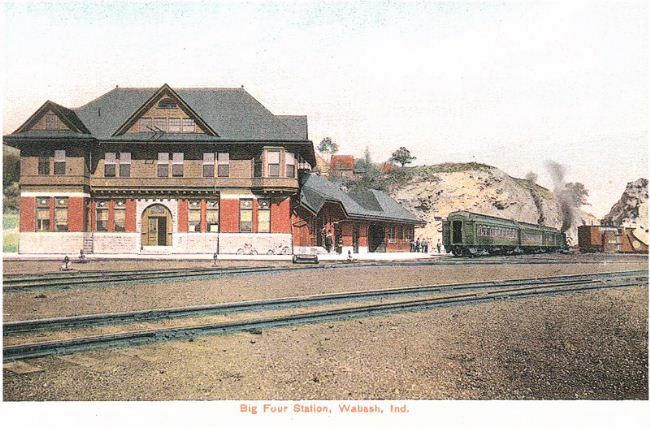 Ok, at last we have a good photo of the Warsaw depot courtesy of Rob Blackford who said, "I can not remember where I ran across this, but it is the best picture I have found to compare to modern day landmarks. 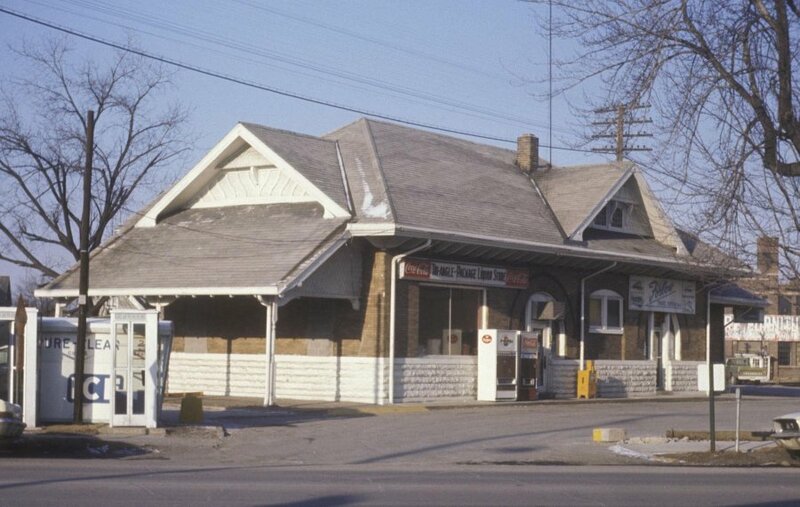 I still refer to your website for the best historical info for the now NS Marion Branch." Photo courtesy of Rob Blackford. 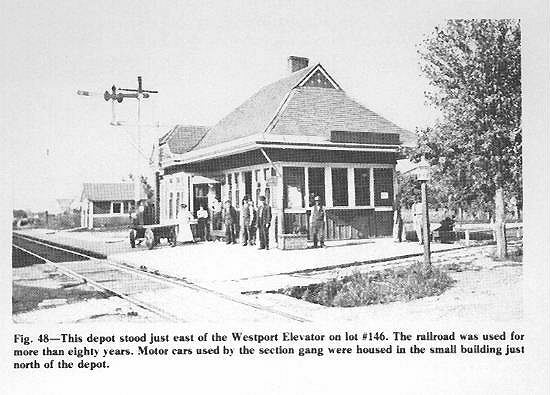 Westport was an exchange point between the NYC and Milwaukee Road. 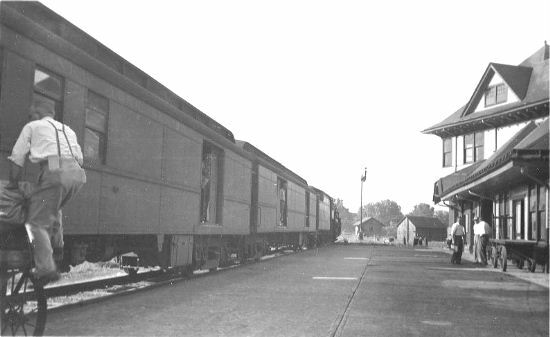 There were long strings of coal and coke cars brought in by the New York Central and left on the Wye to be picked up by the Southern (Milw). There were also many cars of Bedford stone brought in by the Southern to be picked up by the Central. 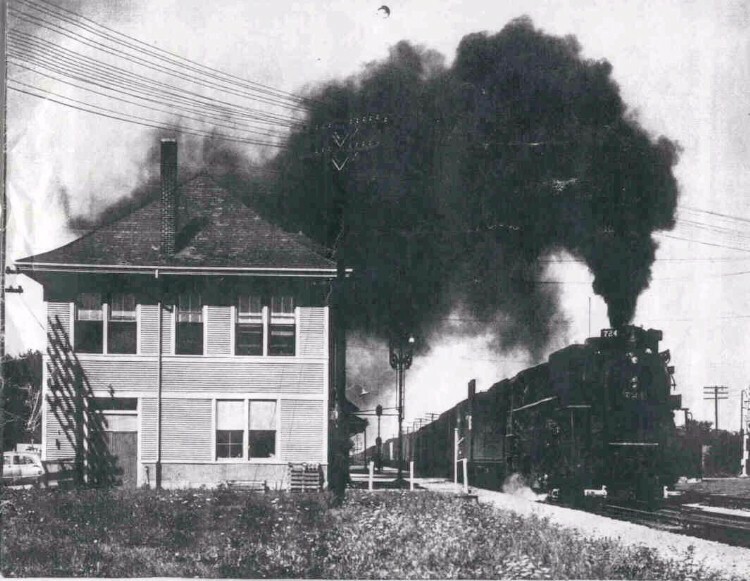 Also, the old "Southern" (Milwaukee Road) scheduled several trains a day, including passenger trains, and many railroaders layed-over in Westport, taking rooms at the Owens hotel building and at other rooming houses in town, including the Low Hotel which burned in 1911. 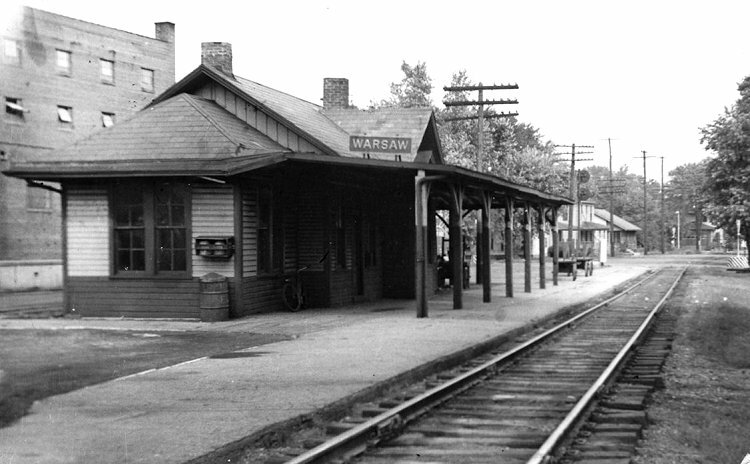 Here is the Yorktown Station about 1953.